"Here today, gone tomorrow" describes many early mining towns -- Dogtown was no exception. 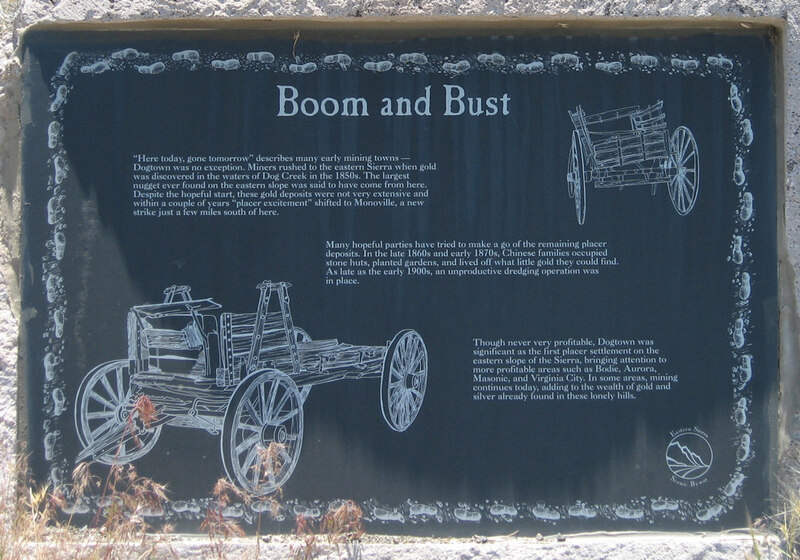 Miners rushed to the eastern Sierra when gold was discovered in the waters of Dog Creek in the 1850s. The largest nugget ever found in the eastern slope was said to have come from here. Despite the hopeful start, these gold deposits were not very extensive and with a couple of years "placer excitement" shofted to Monoville, a new strike just a few miles south of here. Many hopeful parties have tried to make a go of the remaining placer deposits. In the late 1860s and early 1870s, Chinese families oppupied stone huts, planted gardens, and lived off what little gold they could find. As late as the early 1900s, an unproductive dredging operation was in place. Though never very profitable, Dogtown was significant as the first placer settlement on the eastner slope of the Sierra, bringing attention to more profitable areas such as Bodie, Aurora, Masonic, and Virginia City. In some areas, mining continues today, adding to the wealth of gold and silver already found in these lonely hills. Field Notes: near Dog Town. U. S. Highway 395: near Dog Town. Other photos about Geography - Mono County, California or Dog Town.